It's 2019 , what are you doing right now to grow your insurance business? 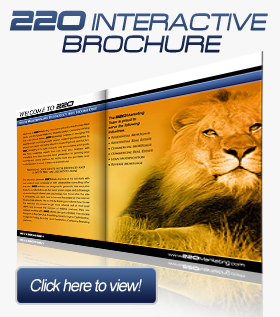 The highly customizable 220 Insurance Marketing System will help you achieve your professional goals this year and beyond. 220 offers insurance marketing tools, websites and tactics that utilize the power of the internet to Drive More Traffic, Convert More Leads, and Get More Referrals than you ever thought possible. We can customize any of our designs to accommodate everything from Life and Health to Auto and Home Owner policies. We work with all types of agents and agencies. 220 even offers support for commercial insurance agents and agencies as well. 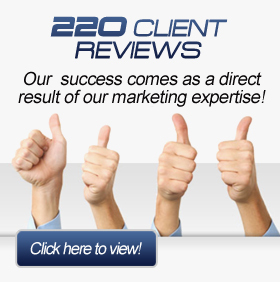 Whether you are in need of a company wide solution or simply an individual plan, 220’s insurance marketing systems are affordable on any sized budget. Our marketing experts work with each of our clients on an ongoing basis after the point of sale to ensure success. We will show you how to utilize splash/landing pages that are integrated within 220 insurance websites to convert more traffic into business. 220 Insurance websites are designed for easy integration with the latest automatic quoting technology available. 220 consultants will also show you how to effectively use the internet to generate more referrals from past clients and how to create more referral partners throughout the community. It’s time to stop losing business to the million dollar marketing budgets! You CAN compete online. Your return on investment is our number one priority. Call us anytime to see how we can help - 877-220-6584. Don’t take our word for it. Look to the right of the page for a demo of one of our latest insurance website designs. We release new ones about every six months. Still not convinced? Not a problem. Sites by 220 Marketing operate on an open source object-oriented PHP platform for maximum flexibility. All of 220 Marketing’s designs use the latest HTML/XHTML W3C validated code for easy integration into any of your existing systems.